This was OK. That’s the best I can say for it. It wasn’t bad, but nothing in it lit me up either. It’s and interesting world Shrum created and I appreciated the bi-sexual lead, but I also found Jesse’s constant sarcasm annoying and I often found her responses to things stupid. Here’s an example, someone is trying to kill you, you know this. They’ve almost succeeded once already, in fact. A friend calls and frantically tells you that people are coming for you and you have to get out of the house fast. Do you drop everything and run or do you whine about how you just made a sandwich and could leaving wait? Hmmmm, this is apparently a hard decision because Jesse did the latter. There were several similar instances. There were also a couple ‘well, isn’t that convenient’ moments. The final one with Lane, especially. So, while the book is competently written, it wasn’t a winner for me. Now, a word of the narration by Hollie Jackson. She did a fine job in the narrative parts of the story and I thought she did a fine job with Jesse and the male characters, as well. However, each and every other female in the book is voiced with such saccharine, borderline teasing tones that I wanted to slap them all. None felt natural. Never have a met a woman who actually speaks like all of these women do. 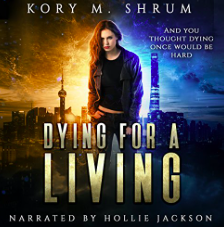 This entry was posted in books/book review and tagged audio book, book review, urban fantasy on April 4, 2019 by Zarah Robinson. 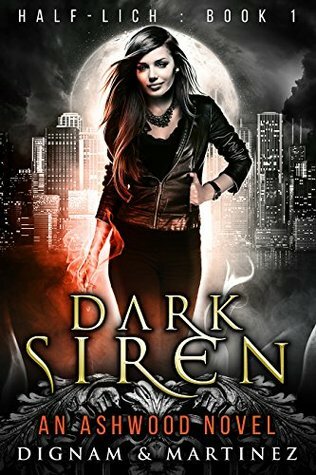 I picked Dark Siren (by Lee Dignam and Katerina Martinez) as a freebie in 2017, but I upgraded to the Audible version in my recent audiobook buying binge. A nightmarish realm. A city of monsters. One girl’s soul caught in the middle. Supernatural bounty hunter Alice Werner loves her job. She gets paid the big bucks to take down her targets and doesn’t ask her clients too many questions as long as the money’s good. But when a girl goes missing and the case feels all too familiar, Alice can’t help but act. Concern for the girl’s safety draws her into a risky case. Compassion keeps her involved when the stakes begin to rise. Desperation forces her to call on an old flame for help. Despite their unfinished past, Alice and Isaac Moreau, a prominent Mage, must work together to save the girl. When clues reveal more than meets the eye, Alice must face her deepest fears and confront demons from her past to protect the victim, and herself, from a fate worse than death. This didn’t work for me. I thought it too much depended on past events that weren’t well integrated into the plot, the characters were fairly shallow—such that I never felt I got to know them—and the writing held far too many similes for comfort. Further, there were several instances of foreshadowing that never came to fruition in the book and the whole thing never really concludes. All in all, I wasn’t impressed. Complicating matters further for me was that I also didn’t care for Laurel Schroeder’s narration style. Her intonation and speech patterns annoyed me. If I had to guess at the cause, without comparing it to the written text, I’d say she over-emphasized commas. This meant that instead of there being a brief, breath-length pause in the middle of a sentence or list, there were whole full stops. Everything felt broken up. This may be a preference thing and not bother others, but it annoyed the heck out of me. This entry was posted in books/book review and tagged audio book, book review, urban fantasy on March 29, 2019 by Zarah Robinson. I picked up a Kindle copy of Eve Langlais‘ A Demon and his Witch, quite a long while ago. And I upgraded to an Audible copy on my recent audio-book buying binge. Roasted at the stake as a witch, while her lover watches, Ysabel sells her soul to the devil in return for revenge. A fair trade until her ex-boyfriend escapes the bowels of Hell and she’s forced to team up with a demon to fetch the jerk back. Remy’s seen a lot of things during his long tenure in Lucifer’s guard, but nothing can prepare him for the witch with the acerbic tongue–and voluptuous figure. Her mouth says ‘Screw you’, but her body screams ‘Take me’. What’s a poor demon to do when his heart makes things even more complicated by goading him to make her his, forever? Before he can decide if his demonizing days are done though, he needs to catch the bad guys, save the girl and then find a way to convince her to love him and not kill him. If I’m honest, there was probably a time (years ago) when I could have read this and only noticed the funny bits (and there are some) and think, “it’s so hot he wants her so bad.” But growing up and learning to think even minimally critically about what I read blitzed it. This is frankly just gross. Which is a shame. I’ve read Langlais in the past and not hated it (here, here and here, all in 2013). Now I have to wonder if those books were better or I was just oblivious to their badness. Mindy Kennedy did a fine job with the narration, but I wonder how many times she had to take a break and step away to keep her voice steady. I didn’t sense a single eye-roll in it. This entry was posted in book review and tagged audio book, book review, demons, erotica on March 27, 2019 by Zarah Robinson.